mPandanda is 3! This is such a long time and for sure all of us have either good and bad moments in this incredible virtual world. In this contest, things are simple. 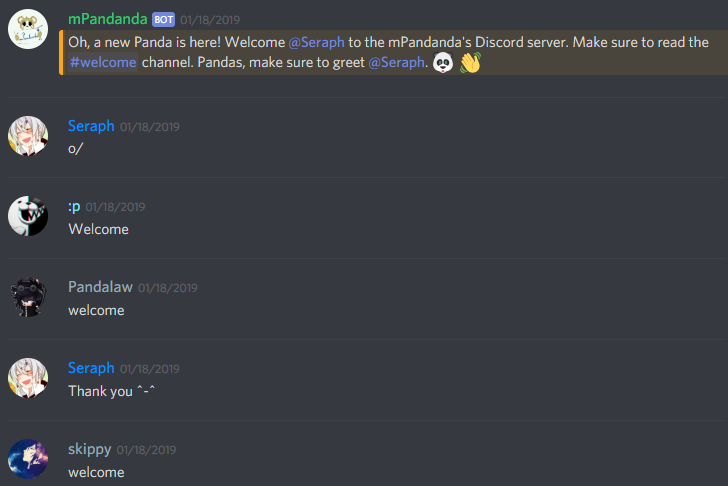 You tell your favourite moment in mPandanda - during a festival, event, on our Discord server, here in Forums, with friends or even alone. The contest will end on Monday, February 18 and winners will be announced the day after. They will win a special Memroies Tee and 1202 coins. We are excited to see your stories and wish you good luck. Write your story below and log in with your mPandanda Account if needed. I guess my favorite moments are when the game opened and obviously the day I got to be in this amazing staff team because when I joined for the first time I was so hyped someone else thought of bringing the game back. I thought it would never come back after the previous one but I was wrong. And when I became a mod I was also happy because I wanted it since old PD mainly because I wanted to help moderate the game not just reporting others. Here's the picture I've got. There are multiple moments in which Mpandanda has brought on a striking interest to me. Examples of this can be the events that are held, the games that we play, and even the teasing of close friends. My favorite moment, however, does not stem inside the game but on the discord intended for it. Around the month of January 2019, I had recalled this game when having a spew of nostalgia hit me. Being the curious person I was, I decided to go on for old times sake. At first, I was upset because it seemed my friends were removed and I couldn't exactly add them back unless I had seen them again but it was worth it considering I made new friends who are all just as awesome. Coincidently, someone who also was in a long period of inactivity came online at the same time I did, so we had a nostalgic chat and welcomed each other back. I met eggplant not too long after where he had explained what I had missed, what happened to some players, and just a general discussion to inform me. Afterward, I noticed the discord. Me, who is active on discord was very excited and anticipated to join. The first thing I saw was welcome messages from a few amounts of people. It felt warming and joyful that people greeted me. With becoming active on the discord, I was introduced to awesome people like Jid, (JiddyJad), Safe (Safej16), Evest (Vasy), Inu (Inumimi), and so much more where that came from, but if I listed everyone, this entire thing would be just a member list! We played question games to find out more about each other, joined voice channels to play together or listen to music together, and simply talked about life. Everyone is so unique and interesting, not to mention kind and funny. So if I were to choose my favorite moment, it would be the moment I returned to this amazing game, only to meet each and every one of you. I know we were supposed to say one favourite moment but I can't decide but one of the memories that I can think about now, which is a pretty funny one was when Panda gave us as giveaway the mod t-shirt by mistake. There are way too many memories that make this game a really nice place. With every day that pass, this game is getting better and better. Every festival, every little update, every little change that is happening makes this a enjoyable game. Every single event is a new memorie. Every single minute in the game is a memorie, even if is about Sandiu Ciorba, Numa numa or just a basic normal day. There are still a lot of things that I have to discover in this game and I am sure until mPandanda will turn 4 years I'll have even more memories. My favourite moment is when I found out that mPandanda is a thing. When I found out that pandanda shut down, I was sad. I checked the site, every few months to see if it had come back, but it never did. May 2018 I was talking to a friend about how there used to be a game called pandanda and told them what it was like. I went to Google pictures of the game to show them and ended up seeing a blog post that said pandanda is back. I then googled it and found mPandanda. I instantly made an account and went online. I started saying hello to everyone and telling them about how I love the game and was hoping for it to come back. I started doing the quests and fishing and bought a lot of clothes with the coins. It was a very happy day and I will always remember how happy I was when I saw the game had come back. I wish I found out earlier but its never too late to become a panda. One of my favorite memories of mPD was reuniting with my old friend eggplant80. We are very good friends and we have known each other for 10 years now, in the start of 2019.
mPandanda has handed me a great experiences with meeting new people, playing games, and just hanging out with the staff in general. It would be very hard to put into words on how close this game has gotten to me. It brought back many memories from the original Pandanda, and made it into it's own + better. Generally speaking, it has been a great experience and it is incredible because, you make very impeccable bonds with other people from all over the world. One of my favorite experiences within mPandanda was the Sweet Love Event! It truly showed how all of us could become one and enjoy one another's company. This was also the event where I met most of our wonderful staff!